Hi ...Welcome back to AYESHA'S KITCHEN. How about an easy dessert recipes with fruit? That too semi raw vegan dessert. 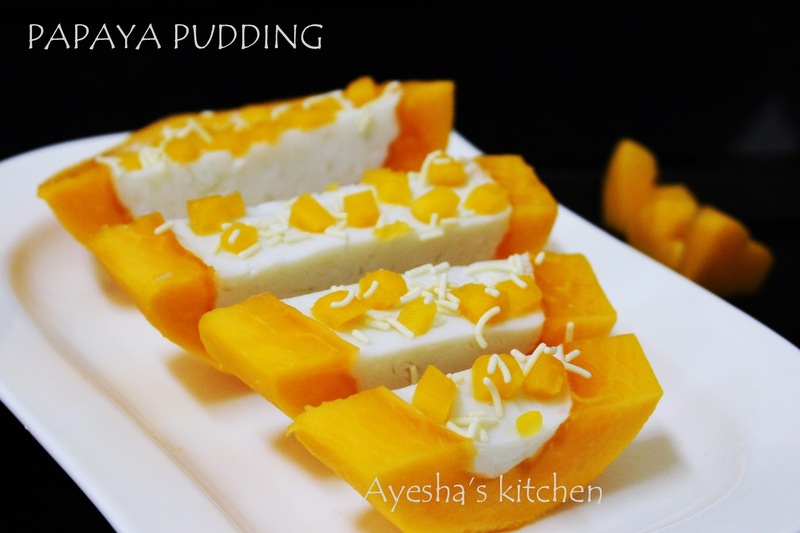 Here is a pudding which tastes too good and perfect for your party dessert ideas. Papaya, the fruit which is rich source of antioxidant nutrients. It has got many health benefits too. Here am going to share a great recipe with ripened papaya. This easy vegan dessert recipe is made with simple ingredients. 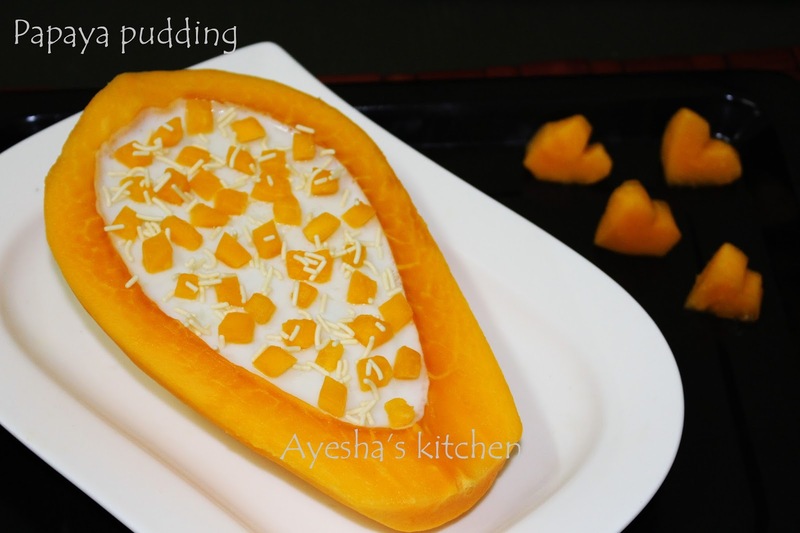 A pudding, which taste yummy and looks awesome ..Here is the easy dessert recipe showing how to make papaya pudding / how to make desserts creatively. Do try this creative party desserts / creative dessert recipes. Enjoy!!!! Place the half of the papaya in a plate. Remove its seed and the middle part carefully with a knife. Level it gently. Keep refrigerated for few minutes. Now prepare the pudding mixture. Boil the milk and once boiled add milkmaid, sugar and vanilla essence. When done, remove from flame and let it cool down well. Mean while melt the china grass in a separate vessel to form a clear liquid (boil it with 4 tbsp of water in a low flame). Add this liquid with the milk mixture along with some chopped papaya pieces. Stir well and pour it in the middle part of the papaya. After 2 minutes, decorate with the remaining chopped papaya pieces. Keep refrigerated until firm. Cut into desired pieces.